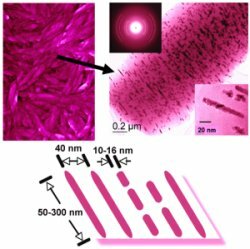 Cellulose nanocrystals serve as templates for interfacial metal cation reduction in solution to form ordered arrangements of metal nanorods. Results: Researchers from Pacific Northwest National Laboratory and Brown University discovered a remarkable process that uses cellulose fibers from cotton as a template to produce uniform metal nanoparticles and nanorods. With sizes on the order of 100 nanometers or less, the small metal structures make dust specks look like boulders. Because of their uniformity and size, the nanomaterials display extraordinary catalytic, electrical and optical properties, depending on the metal used to create them. Researchers see potential applications from improved automotive catalytic converters to better medical imaging devices. Why it matters: Using cellulose's inherent chemical reducing abilities, the researchers can quickly produce these nanostructured materials with controlled size and ordering from less expensive materials. "Our research results represent the first report of the efficacy of nanocrystalline cellulose templates in driving the formation of ordered metal nanostructures at surfaces," said PNNL Fellow and principal investigator Greg Exarhos. In this new procedure, only minimal waste is produced. "Other processes use a lot of chemicals. Ours uses just the metal salt, a dilute mineral acid and natural cellulose. This really is a green process," said PNNL staff scientist Yongsoon Shin. As the demand for nanoparticles and nanorods grows, faster, greener methods could reduce the costs and environmental footprint of production. Methods: Cellulose is the chief component in the cell walls of cotton and other plants, making it a renewable resource and an ideal template for this process. The researchers begin by tearing up paper and treating it with a small amount of acid to free the existing crystalline cellulose component while dissolving the non-crystalline components. The isolated nanocrystalline cellulose fibers are characterized by regions of carbon-oxygen and oxygen-hydrogen (hydroxyl groups) that are regularly oriented along specific directions of the fibers. Next, a solution containing metal precursors that comprise the particles or rods is added to the cellulose. The nanometal particles begin to form on the ordered hydroxyl group regions of the cellulose fibers and remain attached to the cellulose. The nanoparticle-studded cellulose, which looks like a piece of plastic wrap, is then removed from the solution and dried for several hours at temperatures between 160 to 200 degrees Celsius to yield the final product. In their experiments, the researchers have created uniform gold, silver, copper, nickel, and zirconia particles and rods, along with other noble, transition metal and metal oxide particles. What's next: The research team is looking at using the nanoparticle-studded cellulose fibers as catalysts. Enhanced catalytic activity already has been observed in preliminary measurements where conversion efficiencies in excess of 93% have been measured for the simple reaction that breaks methylene blue into more benign products. Citation: Shin , Y, C Yao, WM Risen, Jr., and GJ Exarhos. 2007. "Controlled Formation of Colloidal Carbon Spheres with Core-Shell Structures from Cellulose." Presented by Yongsoon Shin (Invited Speaker) at 2007 American Chemical Society Spring Meeting, Chicago, IL on March 27, 2007.